Does your home have a cat superhighway? The term “cat superhighway” was coined by Cat Daddy Jackson Galaxy. 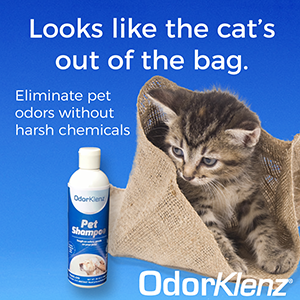 In most episodes of My Cat From Hell, you can watch him recommend some version of this environmental modification designed to give cats a way to traverse their indoor environment as if they were outdoors. Cat superhighways are especially important in households with more than one cat. They give cats opportunities to share territory on more than one level, without bumping into each other and creating possible altercations. 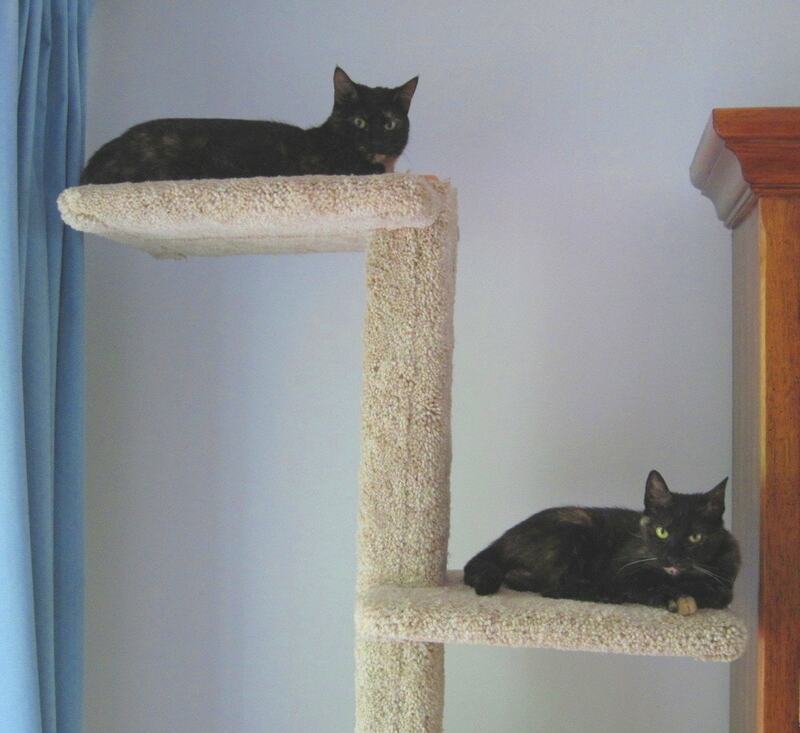 You can create a cat superhighway by using cat trees and condos or wall-mounted cat shelves and stairs. You can also use existing furniture. Our cat superhighway includes the cat tree pictured in the photo at the top of the post, and extends to the top of the dining room cabinet next to it. The cat tree is next to the sliding glass doors, offering a great view of our backyard. I’ve placed a soft blanket on top of the dining room cabinet, and occasionally Ruby or Allegra take a nap up there. 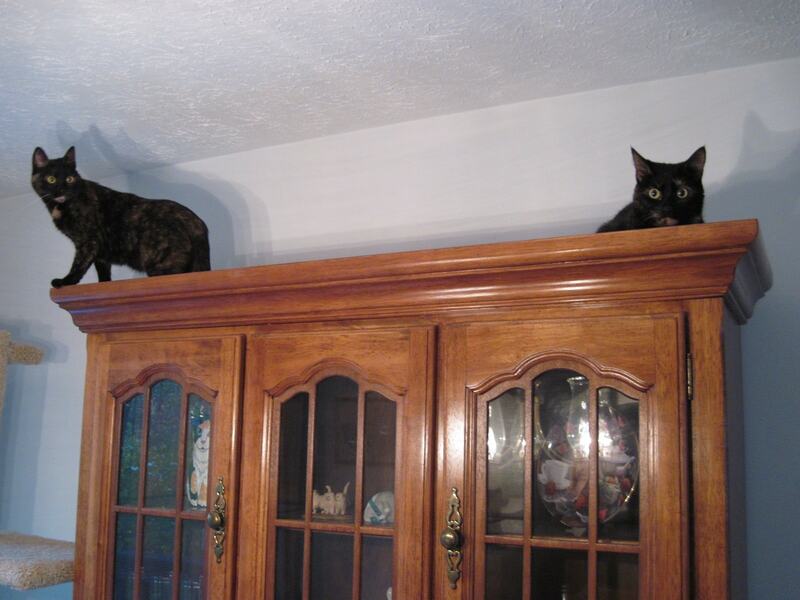 They usually use the cat tree as their on and off ramp, but will sometimes jump from the top of the cabinet to the dining table for a quicker exit. I’m working on creating a more gradual exit ramp, using either a second cat tree or wall shelves, on the other side of the cabinet. For a great example of how to create a cat superhighway, check out Kate Benjamin’s makeover of Jackson Galaxy’s home. Does your home have a cat superhighway? Do you have ideas on how to create one? 14 Comments on Does your home have a cat superhighway? what a great house. I want one of those. Because my cat has arthritis in one elbow, I’ve set things up in the house so he can get to various places and only have to jump 18″ or less at any one point along the way. We are very close now to beginning construction on an outdoor Catio. I can’t wait to have this completed for him! He has always been indoor/outdoor, but at age 13 and with arthritis, it’s time for my fearless explorer to find his adventures in his own back yard! One time I hired an animal communicator to help me with all my animals. This particular cat, Jack, she told me loves his freedom and outdoor time more than most any cat she’d communicated with. She said it means everything to him. I hope he can be happy in a well-thought-out Catio. Any time I’ve tried to transition him to being an indoor kitty, he was, indeed, thoroughly miserable. We’ve always had a cat superhighway in every place we’ve lived, but we called it a “flight path”. Unfortunately the stairs from basement to first floor and from first to second are kind of like a funnel but at least wide enough for two cats up and down without touching, and landings and leapings top and bottom, but we have very little decorate stuff here because it’s so small and business comes first, that every surface, and there are many, can accommodate cats of all sizes, ages and inclinations. If Cookie could get herself anywhere in the house but could not jump, then I guess the steps and landings work well! Who needs decorative stuff when you have cats, Bernadette! My house is small and definitely has a super highway….or two! We have a loft, great high cabinets, furniture walkway and all. Where I need to do some creative planning is in the outdoor area that I created for my cats. It doesn’t have multi levels yet and needs to be enclosed on the top before I can do that. At this point it is safe because I have the high inverted fencing but another level of a cat walk would make escape easy and we can’t do that! It is interesting to look at an environment from the cats perspective. I think I habitually do that these days! Sounds like your kitties live in kitty paradise, Candace! It is fun to see an environment through cats’ eyes, isn’t it? Oscar never felt a need to be up high, he was happy to be on the bed or the couch or any chair, he’s just a contented cat. The new cat Riley on the other hand is on top of everything, the freezer, the hutch, climbing the fireplace, going outside the railing on the steps, all the things Oscar probably never thought of doing. Riley sounds like quite the adventurer, Kelly! We don’t so much have one inside but they have an enclosed area that has multiple spots that they can get to jump around on and climb up. Hubby built different shelf heights to jump on and then some to lay on. There is a kitty door in our laundry room window where they can come and go as they please. Their walkway is enclosed so that they can’t get loose and it goes from the back of the house around the side to their area. They can then go up another section to get to the enclosed front porch. They love it! Your outdoor enclosure sounds like kitty paradise, Cindy! Hi Miss Ingrid! My whole house is a superhighway….HAHA….seriously though, because I have a bad knee (falls out of joint easily) I don’t do a lot of climbing because it’s tough to jump down BUT I do love zooming up and down the three flights of stairs and that’s MY kinda highway! Mom says it’s great exercise too and I know that’s important for me at my age. Sounds like a great exercise circuit, Sammy! 2Pingbacks & Trackbacks on Does your home have a cat superhighway?